The ancient cultural landscape on the confluence of the Dyje and Želetavka rivers has been inhabited since Neolithic times. According to the local findings a Great Moravian fortified settlement used to stand near the castle in the 8th – 9th centuries. The castle was an important support point of the Premyslide dynasty. It was built on a narrow rocky promontory about 70 m above the surface of the river Želetavka, which flows around the promontory. The small town of Bítovec was established below the castle, and served as an important stop for merchants and pilgrims travelling from Austria towards Prague. The king entrusted Prince Conrad Oto to take control over the Premyslide castles. Later, during the reign of Přemysl Otakar I, Bítov became the centre of one of the Moravian regions – the Bítov district. The castle ruled over the areas of Slavonice, Dačice, Jemnice, Moravské Budějovice and Telč. The oldest preserved stone structure at the castle comes from these glorious days – the defence pointed-edge tower with Romanesque foundations. The first written note about Bítov comes from the foundation paper for cannonry at Stará Boleslav, dating back to 1046. The core of the document leads to the assumption that Bítov castle was founded by Prince Břetislav I. 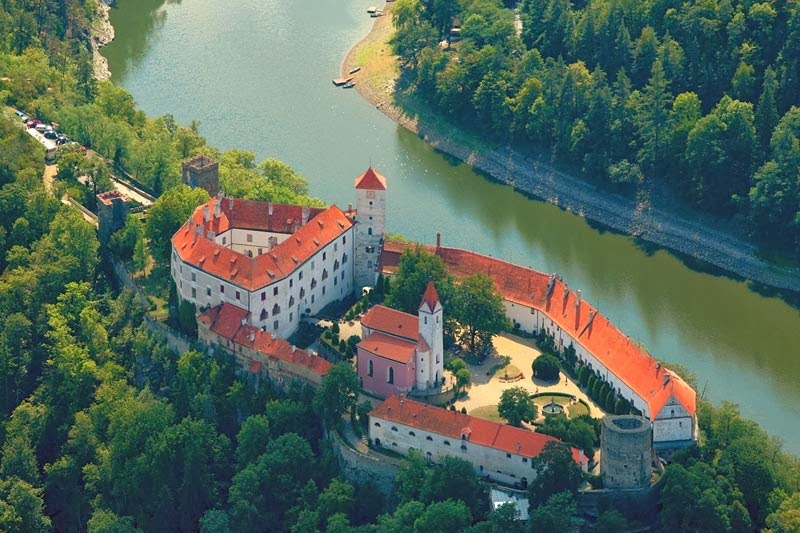 The continuous fortification line of castles protecting the Czech-Austrian border was established here, on the river Dyje, at the beginning of the 12th century. It is interesting that a similar fortification line was built also on the Austrian side to protect their land from Czech attacks (Raabs, Pernegg, Walkenstein, and other castles). After the death of the last male Premyslide (the murder of Wenceslas III in Olomouc), the castle, as a fiefdom, becomes the property of the old aristocratic family of the Lichtenburgs in 1307. The Lichtenburgs descended from the large Czech family of the Lords of Ronov. The founder of the family is thought to be Smil Světlický, the builder of the family castle of Světlík (Lichtenburg). The family became wealthy from their silver mines near the today’s Havlíčkův Brod. In 1278 Bítov was in the hands of Rajmund, who becames the founder of the Moravian branch of the Lichtenburgs. He was also the first Moravian Land Marshall. During Rajmund’s days the castle went through substantial reconstruction – its centre moved higher up the rock towards the east where he had built a massive fortification with three more towers and a new residential quarter. The castle church of the Assumption of Virgin Mary was also newly built. To reinforce their powers the Lichtenburgs built another castle – Cornštejn (meaning sulky or truculent castle, from the German name of Zornstein). Rajmund’s sons Smil and Čeněk made the castle their permanent seat and started calling themselves the Bítov Lords of Lichtenburg. Bítov thus became one of the main Lichtenburg residences for the next 250 years. The Lichtenburgs bravely fought on the side of the Czech kings against the Prussians, the Hungarians and the Turks. This is also why they always had great authority in Czech politics. The last male heir was Jindřich of Lichtenburg, who died on September 29, 1572, leaving the castle and property to his sisters. Bítov was held by Ludmila, who sold it to Austrian aristocrat Wolf Strein of Schwarzenau (marshal of Znojmo castle) in 1576. The following 36 years of Strein rule at Bítov was a mere episode. Wolf’s son Hanus Wolfart, inspired by the period’s great aristocrats of Italy, after purchasing a chateau in Uherčice launched a costly reconstruction, turning the castle into a renaissance seat in the style of North Italy, with arcaded courtyard and gardens. This, along with the demanding life of a renaissance cavalier (feasts, dances, mistresses, etc.) amassed an enormous debt, forcing him to sell his family holdings. Bítov was sold as the first of them in 1612. He also lost his beloved chateau in Uherčice. The Jankov Lords of Vlašim took their name from the village of Jankov near Benešov. Jan I Jankovský of Vlašim was the first to move to Moravia and in 1405 he is noted as a member of the Land Court. The Bítov dominion was bought by Fridrich Jankovský of Vlašim, one of the most powerful Moravian aristocrats in the aftermath of the events the White Mountain, being also one of the authors of the Moravian constitution. Moravian patriot Fridrich commissioned the building of an agricultural complex within the southern ramparts, establishing a successful brewery there. His son Hynek – imperial councillor and advisor to Emperor Ferdinand III wrote the first Czech work on hippology – The Equestrian Apotheque. During the two Swedish attacks he lent money to his vassals to pay a ransom and protected his castle by giving an unspecified number of beer casks free to the Swedes. In 1638 he extended the castle church and started building a residential palace with an arcaded courtyard and a gate tower. He established a new entrance to the castle and fitted a new bridge. From the outside part of the gunnery wall he attached the so-called Swedish chapel. After his death the castle was inherited by his son Maxmilian Arnošt I. Unfortunately he turned out to be a lunatic and the castle was run by his wife Alžběta. At that time the reconstruction of the southern wing was taking place – the characteristic supportive pillars were erected to reinforce the stability. Maxmilian II Jankovský of Vlašim married the heir of Dietrichsteins and Dauns in Vienna and as a close friend of Joseph I he was ennobled as a count. His wife was Catherine of Lemberg – the last heir of Adam Zrinsky – who brought the famous collection of weapons and her family library to the castle. After Maxmilian’s daughter Marie Johanna married countess Cavriani, and following a long dispute between the heirs, the castle ended up with the nephew of Maxmilian František – Count Daun. The Dauns were an ancient family, originating in the Rhineland town of Daun. Legend says that the name Daun comes from the Celtic “Dune”, which means hill. The time of their greatest social rise was during the Thirty Years’ War, when they were ennobled as counts for their military services. The field marshal and imperial advisor Vilém Jan Antonín Daun received citizenship in Bohemia and Hungary, as well as Moravia. One of his sons, Jindřich Josef, whose wife was the daughter of count Max of Vlašim, Marie Leopoldina, founded the Moravian-Austrian line of the family. Bítov was one of the seats of this line. The castle went through further construction development. A fountain was built in the place of the original well. The northern wing with castle kitchen is built. The Dauns built a theatre instead of an old granary, and on the northern side they added an Empire carriage shed with stables. A number of follies were constructed in the forest park (a rotunda, an ornamental well and the Love Lake), and the gardens were reconstructed too. František’s son Jindřich extended the castle church and tomb. The castle was adjusted to fit the New Gothic period style, complete with the palace interiors. After Jindřich’s death, despite the protests of his brothers Vladimír and Otakar, Jindřich’s widow Antonie Countess Voračická of Bissingen, sold all the furnishings of the palace. After the Dauns the castle was inherited by the Haugwitzs. The Haugwitzs are also an ancient family of Slavonic origin, coming probably from Meisen. Via the Haugwitz estate in Lusatia, from which they derived their name, they moved to Silesia. Their coat of arms was a black ram’s head on a red plate. In Moravia they appeared in the 14th century. In 1752 the Haugwitz counts bought the Náměšť nad Oslavou dominion, which became their family seat. It was Náměšť where they moved all the furnishings from Bítov, including the large collection of weapons. The most famous member of the family was Bedřich Vilém, a prominent politician, Czech and Austrian chancellor and advisor to Marie Therese, after 1759 awarded the Order of the Golden Fleece, and author of enlightenment reforms. In 1906 Bítov changed hands again; it was bought by Jan I Count Zamojski for three million Crowns. The Zamojskis were a Polish aristocratic family based in Poland, Russia, and Austria. Jan chose Bítov upon the recommendation of his relatives the Stadnickys from nearby Vranov. The Zamojskis were famous Polish politicians and military leaders. They spent only two years at Bítov, after which the castle went to František prince Radziwill. The Radziwill princes originated from Lithuania and they were the only princely family in the history of Bítov. Jiří, as a cardinal and bishop of Vilnius and Cracow was one of the candidates for Pope. In 1908 Bítov was taken over by the young prince František, nephew of count Jan Zamojski; he was a well-known conservative politician and leader of the Polish aristocracy. In 1912 František sold Bítov to an Austrian industrialist, Sudeten German Jiří Karel the elder, Baron Haas of Hasenfels.